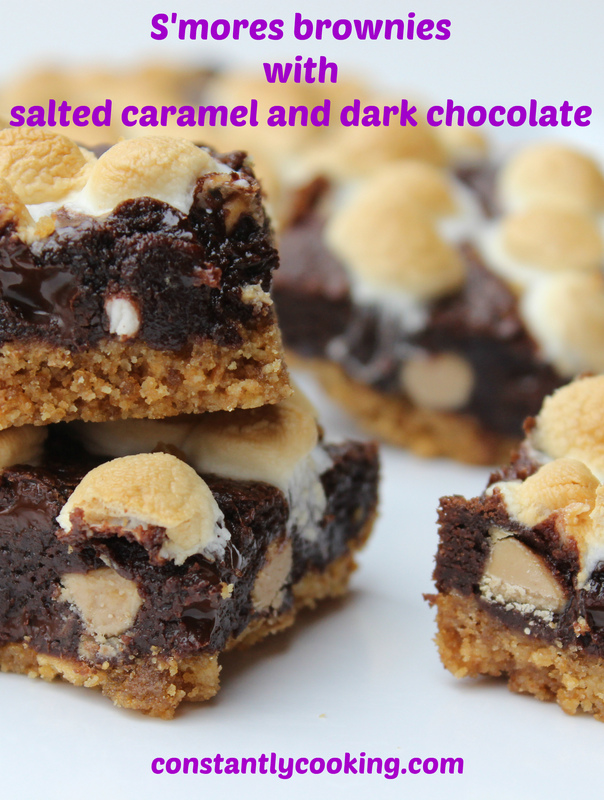 A favourite campfire treat gets a fabulous makeover! Rich, gooey and deliciously decadent, these brownies are one of the most wonderful things I have ever baked. 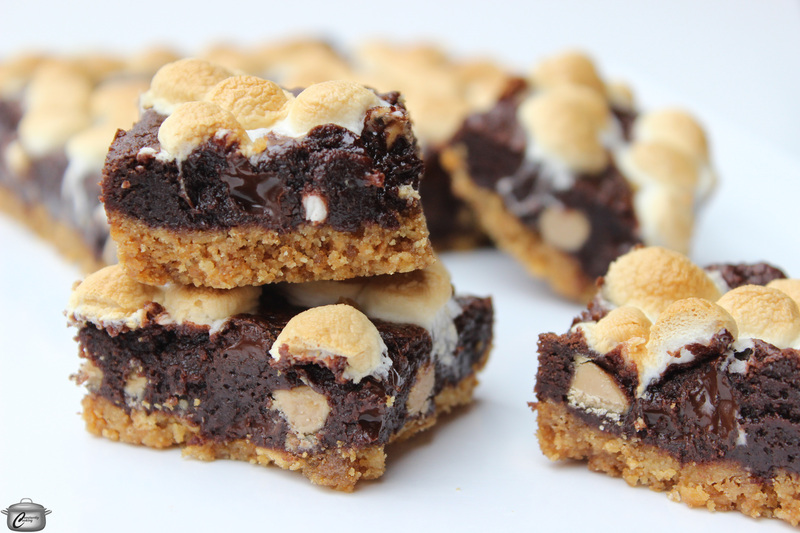 Putting a graham cracker crust under my favourite chewy brownie recipe, throwing in some salted caramel baking chips and popping a layer of marshmallows on top really takes this dessert to the next level. These squares are super quick and easy to prepare and just one bite definitely made me feel like I one was step closer to summer campfires. Preheat oven to 350F. Line an 8 x 8 inch (20 x 20 cm) baking pan with parchment paper and set aside. In a small bowl, combine graham crumbs, brown sugar and melted butter until evenly blended. Press into bottom of prepared pan and bake for 10 minutes. While crust is baking, in a medium bowl, combine brown sugar, cocoa powder and espresso powder. Add melted butter and beat well. Add vanilla and egg and beat well again. Add flour, dark chocolate chips and salted caramel chips and stir until flour is completely incorporated. Spread the brownie batter on top of the baked graham crust, using a spatula or the back of a spoon to spread evenly in the pan. Scatter the mini-marshmallows evenly over top of the brownie batter. Let cool and cut into squares approximately 1.5 inch x 2 inches (3.75 x 5 cm) in size. Store leftovers in an airtight container for 3 days or freeze for up to 3 months. This entry was posted in baking, chocolate, Dessert, Desserts and tagged baking chips, brownie, campfire, Chipits, chocolate, cocoa, dark chocolate, marshmallow, Paula Roy, picnic, s'mores, salted caramel, summer, treat. Bookmark the permalink.